On 12 August, in what has become an annual event, MAECare partnered with The Venue at the Marjorie & Arnold Ziff Community Centre to give people a chance to try out many of the different exercise activities we offer. With the help of some of our wonderful tutors, we provided tasters of Extend, Zumba Gold, Yoga, Ping Pong and Nintendo Wii. 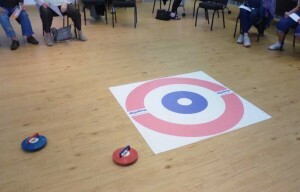 Special thanks also to Allyson Bertram of Leeds City Council who brought along her Boccia and New Age Kurling sets so there was something for everyone, regardless of level of experience or mobility. Our hope is that having a chance to try out these activities will encourage people to attend one or more of the classes regularly, thus improving their overall physical and mental health. A particularly popular activity, somewhat to the surprise of staff, was the “Just Dance” game on the Nintendo Wii, which asks people to mirror simple dance moves to lively music from the likes of Elvis Presley and Blondie. Emily will be figuring out how to incorporate this fun form of exercise into MAECare’s programming so stay tuned! Stretch a net across three tables and Voila! Ping Pong anywhere!